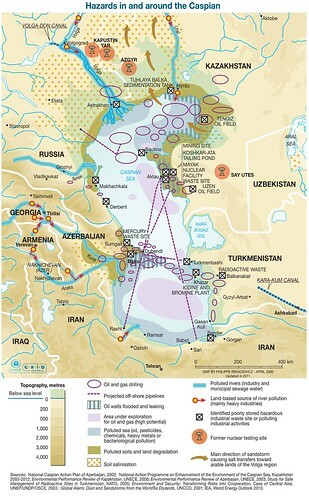 Many opportunities are offered by the Caspian Sea region. It is important that they are handled with care in order to maintain the rich biological and mineral resources over a long time. The natural wealth of the region around the Caspian Sea in mineral resources also involves high metal concentrations. Industrial activities, in particular mining, are raising the metal concentration in sediments to levels exceeding permissible limits. Often, once the oil extraction activity stops, waste remains and constitutes a hazard. 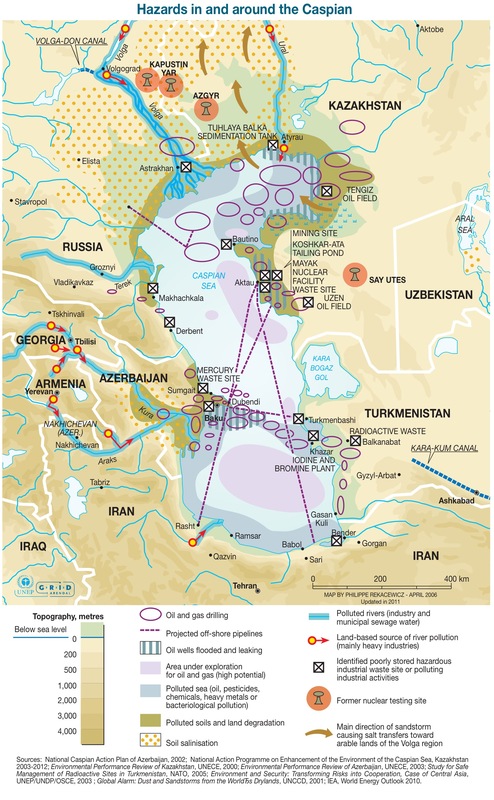 In Kazakhstan there are 19 oilfields with 1485 oil wells in the coastal zone of the Caspian Sea, including 148 in the flooded zone. Drilling technology in the 1960s to 1980s did not account for the corrosive nature of seawater and its effects on metal casing and lay head. Over time, wells have become considerable sources of marine pollution. Some 600 000 hectares of land in the Atyrau and Mangystau Oblasts of Kazakhstan are polluted with a thick layer of oil penetrating the soil to a depth 8 to 10 metres and polluting the ground water. About 30 000 hectares of soil on Azerbaijan’s Absheron peninsula is polluted by oil products and various forms of industrial waste.